Atlanta’s flag centers the city seal in gold outline on a blue field. On a field of 2 by 3 units, the seal’s diameter is roughly 1.5 units. The city seal features a phoenix, with eight rays ringing its head, rising from flames. Above the phoenix is RESURGENS. Around the lower edge is 1847 ATLANTA, GA. 1865. The two dates, although appearing below the wings of the phoenix, are oriented clockwise to read in the direction of “RESURGENS”; the city’s name and state abbreviation run counterclockwise. The seal is edged with a solid line, within which is a double beaded line; the phoenix’s wings extend slightly beyond the outermost line. All letters are in an outline font. Just as the phoenix, fabled bird of myth and story, rose from its ashes to begin a new life, the people of Atlanta returned to the ashes of their city without bitterness or self-pity, and began the gigantic task which lay before them. Their seal is an enduring symbol of the courage, vision and selflessness they brought to that task … reminders of a gallant past, of the civic spirit which will make tomorrow the full realization of today’s hopes and plans. In Latin, Resurgens means “Rising again”. Officially adopted by ordinance of the city council (date unknown). Atlanta adopted its charter and seal in 1847. In 1865, rebuilding of the city began after the devastation of the Civil War. The ordinance of adoption also mentions a city pennant and a city ensign, but it is uncertain if these have ever been used. While there is a civic flag, I have never seen or run across documentation of the city ensign or the city pennant. Maybe the flag is meant to be at least the flag and ensign; however, it is not in the shape of a pennant. Apparently, the pennant (and ensign) were never adopted. Secondly, many may ask about Atlanta being landlocked. While the city is landlocked, the Chattahoochee River flows through and by the city so an ensign is not totally out of the question. 52-101. (826) City flags.--There shall be three flags of the City of Atlanta: A civic flag, a city ensign and a pennant. The colors of each shall be yellow and blue, of the hues and tints shown on the patterns herein required to be kept of file. The form, device and arrangement of colors of each shall be as shown upon the patterns hereby adopted and directed to be placed and kept of file in the office of the Clerk of Council, exact copies of which, appropriately marked, shall be displayed in public in the City Hall. 52-102. (825) Corporate seal of the city.--The corporate seal of the City of Atlanta shall be a round seal, made of silver, 2-1/4 inches in diameter. The device thereon shall consist of an engraving of a phoenix rising from its ashes and the inscription, "Resurgens 1847-1865;" the word meaning "rising again," the first date marking the year the city's first charter was granted and the second date signifying the year of the beginning of the city's rehabilitation after its destruction by the Federal armies in 1864. The seal shall remain in the office of the Clerk of Council and shall not be affixed to any instrument except by order of the Mayor. 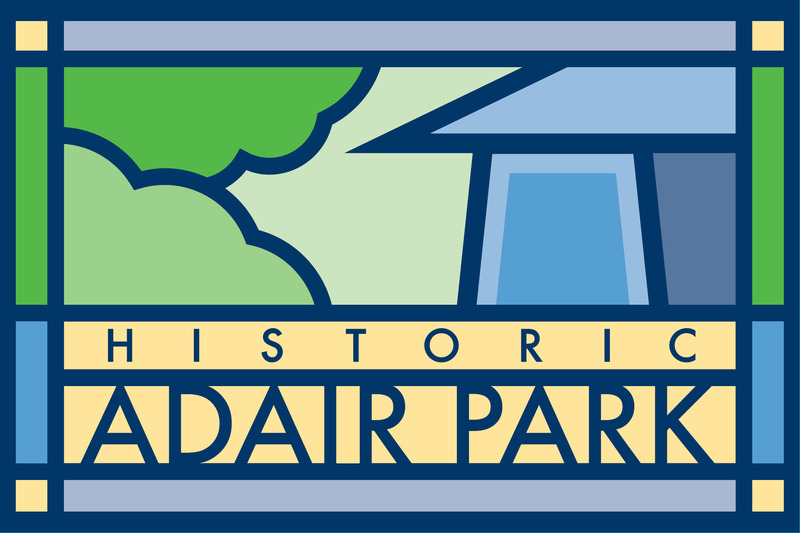 And a very interesting flag, with a stained glass Art Nouveau style showing a silhouette of a house and trees in shades of blue, green and buff: adairpark.com/adair-park-today/merchandise (image only at adairparkatlanta.files.wordpress.com/2010/09/adair-park-flag1.jpg). Berkeley Park is located in northwest Atlanta, GA, just west of Midtown and below the southern boundary of Buckhead. The flag was designed in 2005 by Patrick Brady of Berkeley Park. The geese are a common sight in Berkeley Park as we often see and hear them flying overhead to and from their home at the City Water Reservoir. They are a symbol of the unity of our neighbors and the strength and voice we have as a group within the City of Atlanta. The flag can be seen here: www.berkeleypark.org/flag.asp. "The base of the torch mark logo, made of the five Rings and the number 100, resembles a classical Greek column and recognizes the centennial of the Games. The torch mark's flames gradually evolve into a perfect star symbolizing each athlete's pursuit of excellence. The gold colour in this logo represents gold medals. The green represents laurel branches worn by winners in ancient times, as well as Atlanta's reputation as the City of Trees." An Ebay offer (www.ebay.com/itm/391376169731 - no longer available) showed a hand flag with the design: Five capital letters A, styled in a way that is reminiscent of people, and coloured in the colours of the Olympic Rings, form a circle with almost touching "hands", with black at the top, then continuing around the clock with red, green, yellow, and blue, below this the word "Atlanta" in blue, and below that "1996" in blue but spaced to be as wide as the name, and at the bottom the Olympic Rings, rather small, all on a white field. The reverse of the flag shows the reverse of the design. If the current rules or bid flags were already valid then this would have to be a candidate flag, as it uses the Olympic Rings.